WASHINGTON — The White House has rejected a petition requesting that the government declare the Muslim Brotherhood a terrorist organization. The petition had been first created in July on the White House website, and obtained over 213,000 signatures in just a month. The Obama administration has stated that it will respond to any petition that reaches at least 100,000 signatures in a 30-day period. But in response to the petition, the White House replied recently that although it opposes violence in the name of religion, it does not view the Muslim Brotherhood as being a terrorist organization. “We have not seen credible evidence that the Muslim Brotherhood has renounced its decades-long commitment to non-violence,” it wrote in its brief reply. As previously reported, in 2012, the leader of Egypt’s Muslim Brotherhood organization denounced efforts to halt fighting in Gaza, stating that Palestinians should wage Jihad on the Holy Land. That same year, the Muslim Brotherhood reportedly launched a widespread terror campaign to intimidate Egyptian Christians into avoiding participation in the final round of the presidential elections. Terrorists hit various regions of the country, targeting Christians in their homes, shops, farms and places of work, and strictly threatening them to refrain from participating in the presidential elections or voting for independent candidate Ahmad Shafik. Threats ranged from kidnapping, to burning of their homes, shops and possessions, to murder. 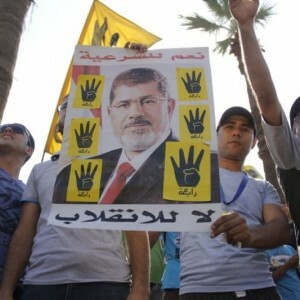 Morsi was overthrown a year later, and United States Senators John McCain and Lindsey Graham met with the Muslim Brotherhood in Cairo to discuss ways to move the country forward following civil unrest.